Value Added Service Providers (VASPs) are external application services that need to submit MMS messages to the Now SMS & MMS Gateway. A VASP could be a customer that is submitting MMS messages through your gateway, or in some cases, a VASP account could be an operator MMSC delivering MMS messages to your gateway. VASP accounts are defined on the “MMSC VASP” configuration dialog. “Account Name” specifies a login name for the VASP to login to your Now SMS & MMS Gateway. In some cases, where a VASP does not have configuration settings to login to the gateway, you should specify an IP address. When an IP address is specified as the “Account Name”, the Now SMS & MMS Gateway will treat any connections from the specified IP address as being from this defined VASP. “Password” specifies a password for the VASP to login to your Now SMS & MMS Gateway. “Account Description” is a descriptive field that can be associated with the VASP. It is not used for any purposes of the VASP making a connection to the gateway. “IP Address Restrictions” specifies one or more IP addresses from which the account is allowed to login to the MMSC. If multiple IP addresses are specified, they should be separated by a comma only, with no white space characters. The “*” character is permitted as a wildcard to allow access from all IP addresses on a particular subnet. When a VASP connects to the MMSC using the MM7 protocol, it should make connections to the configured “HTTP Port Number” on the “MMSC” configuration dialog, using a URL path of “/mm7” (e.g., http://host.name:port/mm7). Unless an IP Address is specified as the “Account Name”, the application should authenticate to the MMSC using HTTP Basic Authentication using the configured “Account Name” and “Password” for the VASP account. 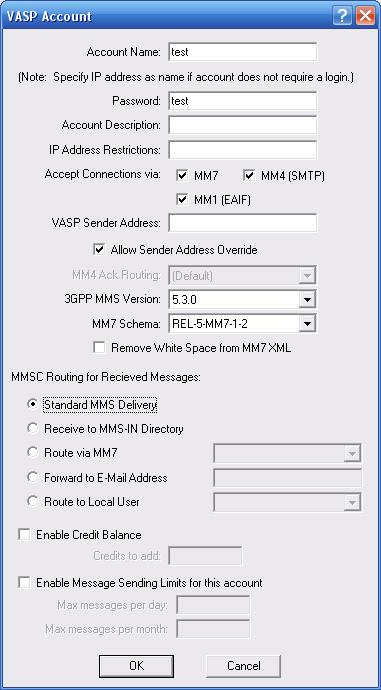 When a VASP connects to the MMSC using the MM4 protocol, it should make connections to the configured “SMTP Port Number” on the “MMSC” configuration dialog. Unless an IP address is specified as the “Account Name”, the application should use “SMTP AUTH” to authenticate to the MMSC. When a VASP connects to the MMSC using the EAIF protocol, it should make connections to the configured “HTTP Port Number” on the “MMSC” configuration dialog, using a URL path of “/eaif”. Unless an IP Address is specified as the “Account Name”, the application should authenticate to the MMSC using either HTTP Basic Authentication, or it can include the username and password in the URL using the following format (http://host.name:port/eaif/username=password). When a VASP connects to the MMSC using the MM1 protocol, it should make connections to the configured “HTTP Port Number” on the “MMSC” configuration dialog, using a URL path of “/mm1”. Unless an IP Address is specified as the “Account Name”, the application should authenticate to the MMSC using either HTTP Basic Authentication, or it can include the username and password in the URL using the following format (http://host.name:port/mm1/username=password). “VASP Sender Address” specifies a default sender address for messages submitted by this VASP. If “Allow Sender Address” is checked, this “VASP Sender Address” is applied as the message sender address only if the VASP did not supply a sender address in a message submission. If “Allow Sender Address” is not checked, the “VASP Sender Address” is applied as the sender address for all messages submitted by the VASP, overriding any sender address specified by the VASP. “MM4 Ack Routing” applies only to VASP accounts that are defined for receiving messages via MM4. When defining an MM4 connection between two operator MMSCs, it is normal to define both an inbound “MMSC VASP” and outbound “MMSC Routing” definition. In order to ensure that MM4 message acknowledgments are delivered correctly, this field should identify the corresponding “MMSC Routing” definition through which MM4 messages are routed back to the other MMSC. 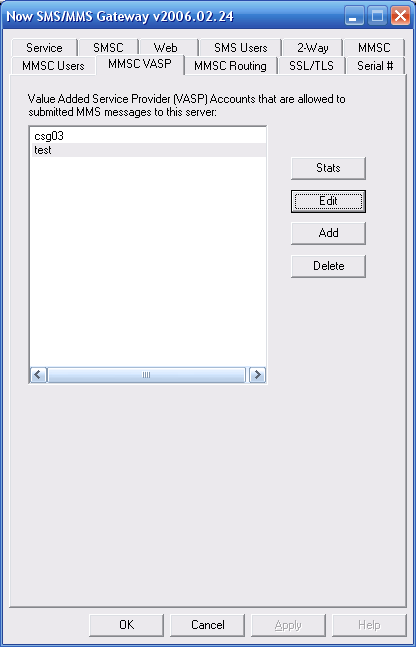 “3GPP MMS Version” controls the MMS Version that the MMSC uses when generating MM7 responses. Set this value only if the VASP requires a specific MMS version setting. “MM7 Schema” controls the MM7 XML Schema that is used when generating MM7 responses. Set this value only if the VASP requires a specific MM7 schema. “Remove White Space from MM7 XML” – The MMSC normally generates MM7 XML in a user friendly format that includes line breaks. Some applications do not like any white space or line breaks within the MM7 XML, and this setting forces any white space to be removed from the XML. When the Now SMS & MMS Gateway receives a message from a VASP account, five options are available for processing the received message. “Standard MMS Delivery” means the message will be queued for outbound delivery by the MMSC as would any other MMS message submitted to the gateway. “Receive to MMS-IN Directory” means that the message will be received and stored to the “MMS-IN” subdirectory of the gateway as a received message file, and will not be delivered externally to the gateway. “Forward to E-Mail Address” means that the message will be forwarded to a specified e-mail address. “Route to Local User” converts the MMS message into an e-mail format so that it can be retrieved by a local user account (“SMS Users”) connecting to the NowSMS server via POP3. For more information, please see E-Mail to SMS/MMS Connectivity. It is also possible to limit the number of messages a VASP can send in a daily or monthly period. To enable daily and monthly limits, check “Enable Message Sending Limits for this account”, and provide sending limit values for “Max messages per day” and “Max messages per month”.